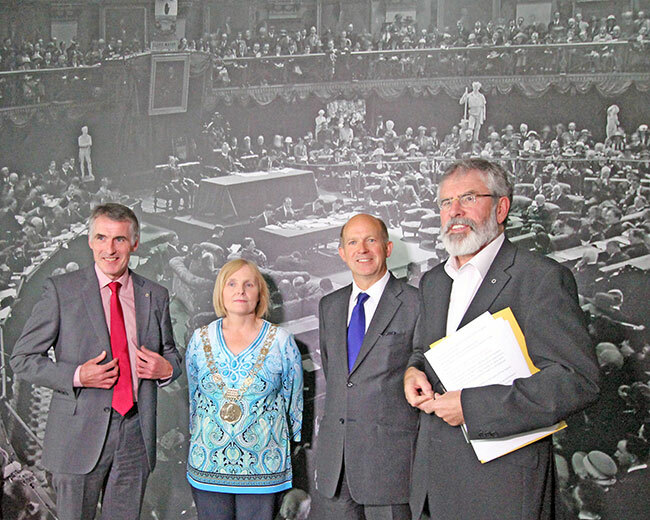 THE BRITISH AMBASSADOR sharing a platform with Gerry Adams to launch Sinn Féin’s booklet on “Uncomfortable Conversations for Reconciliation” put into perspective the crisis contrived by unionist parties exploiting the killing of Kevin McGuigan in Belfast five weeks earlier to try and exclude Sinn Féin from the Stormont Executive on the pretext that the party is linked to the murder. The event was hosted and introduced by Ard Mhéara Bhaile Átha Cliath (Mayor of Dublin City) Críona Ní Dhálaigh in the historic Mansion House, meeting place of the First Dáil, and also addressed by Reverend Heather Morris (former President of the Methodist Church) and Declan Kearney (Sinn Féin’s National Chairperson and the driving force behind the Uncomfortable Conversations initiative). 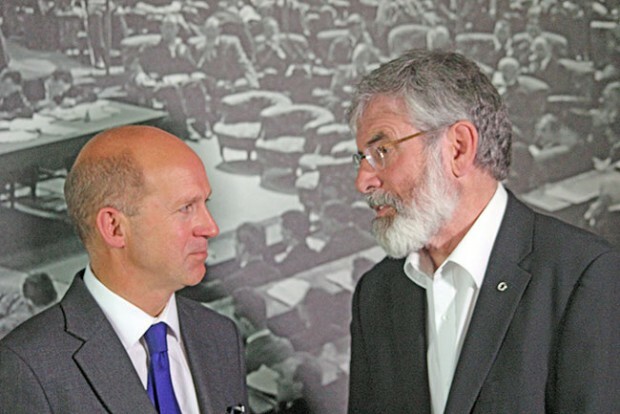 British Ambassador Dominick Chilcott congratulated An Phoblacht “for prompting these Uncomfortable Conversations” in a series of articles from March 2012 which have culminated in what he described as a “remarkable” book. The audience was packed with Ambassadors and high-ranking government representatives from Cuba, the USA, Palestine, South Africa, Spain, China, Greece, Germany, and many others. 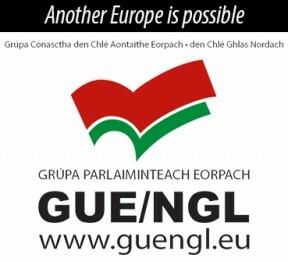 There was also a huge number of representatives from civic society, among them numerous campaigning peace and reconciliation groups (among them Glencree, Corrymeela and Co-operation Ireland) and activists, trade unions, the churches and the media. Notable individuals included Beirut hostage Brian Keenan, former Supreme Court Judge Catherine McGuinness, TDs and senators, Donna Cooney from the 1916 Relatives’ Association, and “Conversations” contributors Orange Order member Rev Brian Kennaway, Rev Chris Hudson and Rev Earl Storey. “I am sorry for the hurt experienced by members of British military forces and civilians during the war; the suffering of unionist people in our society; and equally for the pain of the families of IRA Volunteers and Sinn Féin activists killed; as well as many other nationalist citizens also killed and injured. 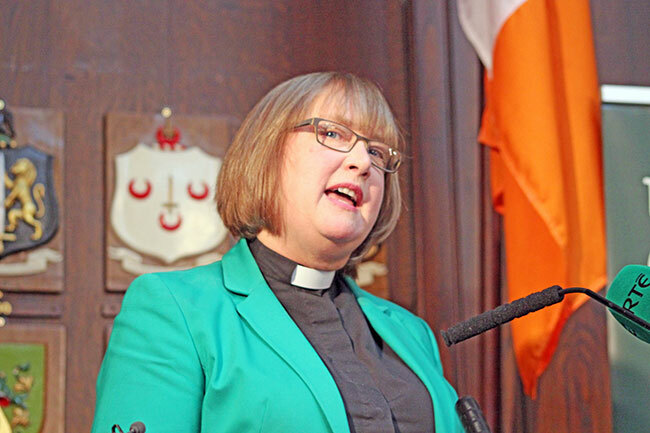 Reverend Heather Morris said that “Uncomfortable” doesn’t seem like an adequate word any more in the process of building peace. “Words like painful, heart-breaking, frustrating feel more adequate. “My personal plea is that everyone (because moves can be made by every side) does whatever it takes to get us back at the table, to get conversations started again. “It has been good to see more voices coming into this particular conversation in the pages of An Phoblacht, even since the publication of this book. The British Ambassador to Ireland opened his speech with a frank admission. “Not being a regular subscriber to Sinn Féin’s monthly newspaper, An Phoblacht,” the British Ambassador said with a smile, “I confess to not having read any of the articles in Uncomfortable Conversations before picking up the book. “These short essays were a revelation. The reader may be surprised by how well written, astute and generous spirited the articles in this book are. “He is right,” the British Ambassador declared. “We must all rise to the challenge. “The great collective task for political leaders on these islands is to overcome the legacy of the past and to build together a better future for everyone, based on mutual respect, parity of esteem, social justice and equality of opportunity. 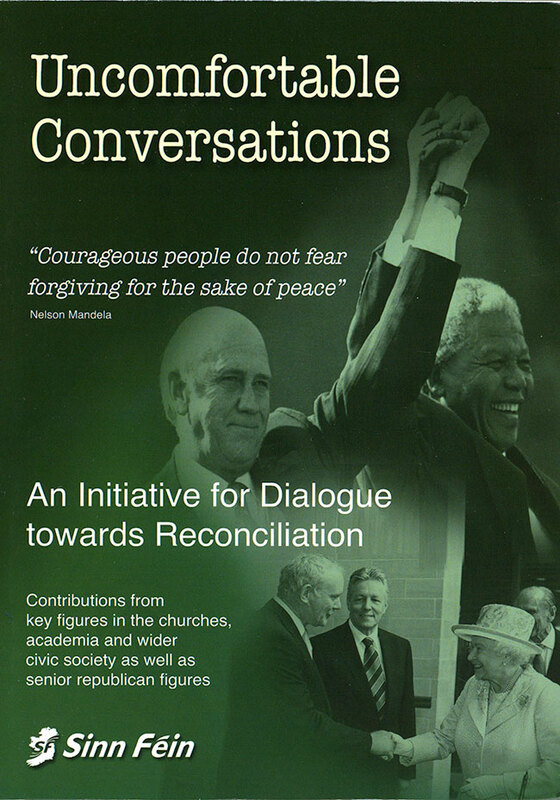 “We all have a strong interest in promoting reconciliation. It is the key to our common, shared future, in whatever constitutional disposition that future is lived. Gerry Adams emphasised that victims and survivors of the conflict who are still seeking justice and truth must be given the strongest possible support and assistance. “Whether they were bereaved by the IRA, by British state agencies, or through collusion with unionist paramilitaries or by unionist paramilitaries, the victims and their families and communities deserve justice. That is an essential ingredient in the reconciliation process. “I know only too well from speaking directly to families of victims of the conflict, including victims of the IRA, that the past is part of their present. The Sinn Féin leader noted that, during her historic visit to Ireland in 2011, Queen Elizabeth “made clear her desire to be part of a process of reconciliation and healing”. The subsequent meeting between Martin McGuinness and Queen Elizabeth in Belfast and the state visit by President Michael D. Higgins to Britain were widely acknowledged, quite rightly, as groundbreaking, he added. In another departure from his script, Gerry Adams revealed that he had personally and privately approached Ambassador Chilcott ahead of the visit to Ireland by Prince Charles to Ireland in May of this year to seek a meeting. “He immediately saw the importance of that. I don’t know what machinations or negotiations went on in between then and the actual meeting, but he had the imagination, the wit and the wisdom to realise that this was an important initiative." Gerry Adams, Martin McGuinness and Senator Trevor Ó Clochartaigh met with Prince Charles in Galway. The conversation, Gerry Adams recounted, was “cordial, relaxed, it was positive despite the fact that we dealt with difficult issues”, including the assassination of Prince Charles’s uncle, Lord Mountbatten, by the IRA of the coast of Sligo in August 1979. “We acknowledged that Charles and his family had been hurt and suffered great loss at Mullaghmore by the actions of Irish republicans. He said he was mindful that two of ‘The Disappeared’ were buried that week, that 1916 leader Thomas Kent was to be given a state funeral the following day, and one of the British Ambassador’s predecessors, Christopher Ewart Biggs was killed by republicans in 1976. “We cannot undo these things but we can work to ensure that they are never repeated,” the republican leader said. “The resolve and responsibility of all political leaders now must be to ensure this; to ensure that no else suffers as a result of conflict; that no other family is bereaved; that the experience of war and of loss and injury is never repeated. Noting that “Orange is one of our national colours” and that “there will be Orange parades in a united Ireland”, the Sinn Féin leader appealed directly to the Orange Order “to begin palying its part in the Peace Process by following the example set by Queen Elizabeth”. He said that republicans need to be “open, imaginative and accommodating” in our approach to achieving Irish reunification and listening to unionists about what they believe the Union offers them.